to your Friday articles . . .
Go to your email account. Find the confirmation email from EvangelismCoach.org. The subject line may say “Confirm your desire to receive” or something like that. Open the verification email from EvangelismCoach.org. Click on the link contained in it. You will go to a thank you page. Your free articles will automatically be sent to you by email. It may take a few additional minutes (and sometimes up to 1 hour) to receive your article. No click == no articles. Why do we make you verify your email? We want our members to enjoy a community that is free of SPAM and other unwanted garbage. Email verification helps to ensure that you will enjoy your experience and that it has been correctly entered. Not receiving the verification email? Double check your email address. We sent the message to the address you entered. If there is an error in this email address then you will not receive the message. To fix this simply click the back button and enter the correct address. Check your spam inbox. Sometimes spam filters can filter out the wrong emails, so if you are sure that you used the correct email address and you do not see the message then you should check your spam box. How to Welcome Church Visitors. 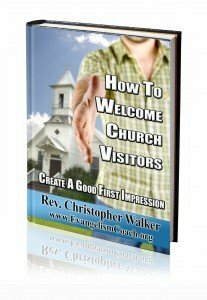 It’s available for instant download after purchase and contains lots of useful information on improving your first impressions for church visitors. Including tips you can use for this weekend. “Thanks for your newsletter and articles. I find them helpful, relevant, timely. Compared to others, you only send out a reasonable amount of emails, typically no more than 2 or 3 a month.” Geoff McLean, Pastor. Your lessons have been so useful and encouraging to me and most important it has challenged me a lot to be mindful of those who visit our church weekly. Thanks so much, I pray that the good Lord will graciously Bless and reward you immensely for what you have been doing to help us young ministers to do well. Once again, I am real grateful. God Bless you!